Overview: Driving like a bat out of hell, Johnny Blaze travels the roads of the American West, looking to find peace with his demonic alter-ego, the Ghost Rider. Month after month, Blaze encounters various threats from both man and demons. He crosses paths with Dr. Strange, Professor Xavier, Hawkeye, and the Two-Gun Kid, in addition to the occasional appearances of Ghost Rider’s teammates in the Champions. One of the highlights of the book (besides it being the final comic of the volume) is issue #50, where Ghost Rider is transported into the past, where he teams up with the Phantom Rider, who made his debut in The Ghost Rider #1 (February 1967). What makes this Essential? : Even in the hardest of reads, I try to find SOMETHING positive about the Essentials and Showcase Presents that I review. But I need help with this volume because I cannot find ANYTHING positive about this book. The writing and art are average at best – even with pencils from legendary talents such as Don Heck, Jim Starlin, and Carmine Infantino. Sadly, very little is done to develop the character, either as Johnny Blaze or as the Ghost Rider. Many of his supporting cast seen in the first volume, such as Stunt Master and Roxanne Simpson, are quickly dropped. With volume 1, there was at least a purpose for the character, as he was trying to free his soul from the Devil. This book just wanders aimlessly. And don’t get me started on the over-abundance of motorcycle-riding foes in this volume. Just because Ghost Rider uses a motorcycle does not mean that everyone he fights has to be on a motorcycle. Would you want a Batman story where issue after issue, he chases after criminals in cars just because Batman uses a Batmobile? So, if you know what was good from this book, please let me know because I sure couldn’t find it. If you like this volume, try: Shade The Changing Man from DC Comics. Writer Michael Fleisher, who starts a long run with Ghost Rider in this volume, was very prolific for both DC and Marvel throughout the 1970s and 1980s. One of his early works was Shade, which was done with the legendary Steve Ditko. The Shade title ran for eight issues, before it was caught up in the DC implosion of 1978. The entire series was collected in The Steve Ditko Omnibus Vol. 1 from DC in 2011. This entry was posted in Ghost Rider, Marvel Essentials and tagged Carmine Infantino, Don Heck, Don Perlin, Gerry Conway, Ghost Rider, Jim Shooter, Michael Fleisher, Roger McKenzie. Bookmark the permalink. 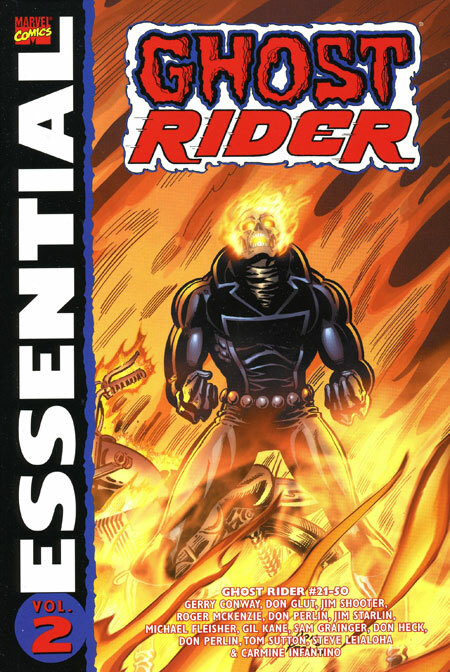 Pingback: Essential Ghost Rider Vol. 2 | Worst. Comic. Podcast. EVER! Pingback: Throwback Thursday – Essential Ghost Rider Vol. 2 – WORST. COMIC. PODCAST. EVER!